light duty cnc machine which is designed for jobs of sign making and art works. Compared with CNC wood router, it is light in machine construction; three axes are using balls crew drive. But that�s enough for jobs of signage and artworks. Materials best for sign making cnc machine is acrylic, plastic, PVC, ACM, PS, with expanded PVC, MDF, plywood, HDPE, foam, and solid wood. Signmaking, badge, arts and crafts, house decoration, exhibits and more. 1) Water cooling spindle can keep working for several hours without rest. On this point, it is superior to air cooled spindle. 2) All axes motion are supported on Taiwan Hiwin square linear guideways. residuum and makes sure the steady working performance of the machine for long-term using. 5) Has the function of re-carving after break point and power failure. 6) Perfect oil-inject system makes maintenance much easier. 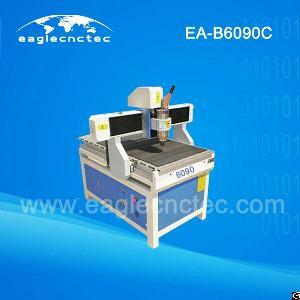 7) This is a light cnc machine with size 6090, a smaller size 3040 desktop cnc carver router is available also. Company Name: Jinan Eagletec Cnc Machinery Co., Ltd.